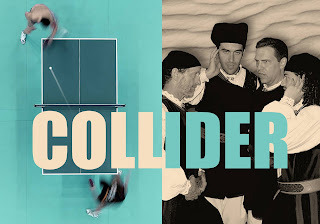 STUDIO4 in downtown Northampton is proud to present COLLIDER, a new series juxtaposing performers from far afield. The COLLIDER series reaches across the arts and into the margins of human endeavor, showcasing masters of craft in singular pursuits—“people doing things”—in folk traditions, the natural and inventive sciences, outsider art, game-playing, and more. COLLIDER 01 on Saturday, April 29 at 8pm will feature a professional ping pong exhibition by top- seeded New England players, to be followed by the captivating sounds of TENORES de ATERÚE. ERNEST VIRGO, the two-time former National Table Tennis Champion of Jamaica and a coach of the USA Table Tennis Team, will square off against Massachusetts native STEVE KASHA, the recent tournament champion at Zing! Table Tennis in Easthampton. Ping pong first appeared as an after-dinner parlor game among the upper classes in Victorian England, who used books as paddles and to serve as a net. Some historians speculate that the game, also known as “gossima” and “whiff-whaff,” was originated by British military officers in India in the 1860s. The first unofficial world championship was held in 1902 and soon after became a global phenomenon. Table tennis was at the center of a diplomatic watershed in 1971, when China invited the U.S. National Team for a series of friendly matches against the home team—the first U.S. delegation to visit since 1949. President Nixon, who visited China a year later, described it as "the week that changed the world." In 1988, table tennis featured for the first time as an Olympic event. Today it is the most popular indoor game in the world. NCTV's 7 Day Film Sprint Kicks Off!